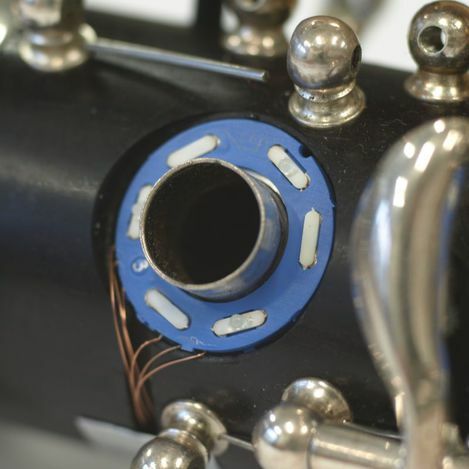 Excerpt from PhD-thesis: Michael Weilguni, "Force Sensors for the Measurement of Finger Forces in Clarinet Playing", Technische Universität Wien, 2013. The blue ring with 8.8 mm diameter is made from LTCC (Low Temperature Co-Fired Ceramics). The white sensing elements are made out of flexible Zirkonium with a piezzo resistive element attached. Three intrumentation amplifiers in the ring provide independent signals to measure finger forces from different directions with a sensitivity of 115 mV/N (maximum load 5 N). 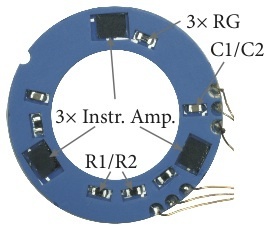 Hand-made ring sensors including three (black) instrumentation amplifiers (AD8235, 2,2 × 1,5 mm²) and 11 soldering points on the back side. 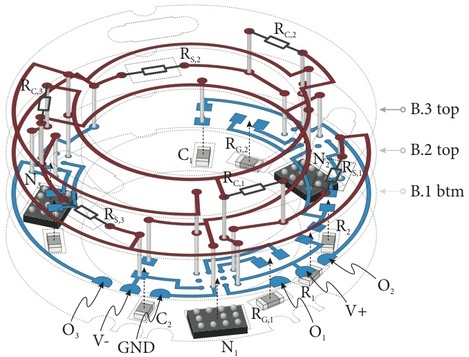 Layout of the ring-shaped force sensor, highlighting sensor section B with electronic devices. The calibration and sensing elements are indicated by resistor symbols. 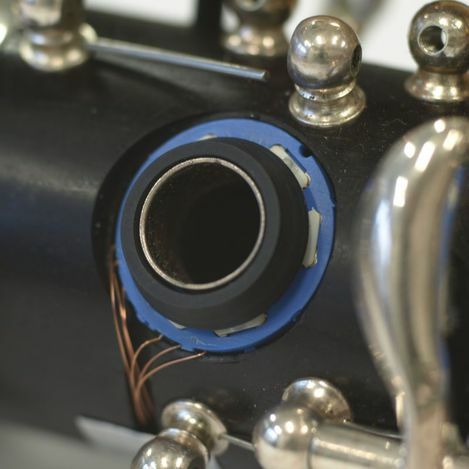 Ring-shaped sensor attached to tone-hole of the clarinet: (left) without POM ring, (right) with POM ring. The surrounded key-work has been dismounted for attaching.